In 1933, a movie was released by then-Radio Pictures (later RKO) that would forever change the notion of Hollywood filmmaking. The movie packed theaters across the U.S. even in the midst of the Great Depression, dazzling audiences with escapist visuals the likes of which they'd never seen before. That film was King Kong, the unlikely story of a monstrous beast... and the beauty that stole his heart. Robert Armstrong stars as Carl Denham, an ambitious filmmaker leading his movie crew on a daring expedition to a remote and mysterious island. When his film's star, Ann Darrow (Fay Wray), is taken by the local natives as an offering to Kong, the giant ape that rules their island, Denham and his crew must venture into the deep jungle to rescue her. Their perilous journey will bring them face to face with Kong, and all manner of other prehistoric dangers. Ultimately, Kong will face a journey as well... a journey with a thrilling conclusion set in the heart of New York City. It would be hard to overestimate the impact that King Kong had on the films that followed it. Perhaps the best comparison would be the way that Star Wars changed moviemaking in the late 1970s and 80s. 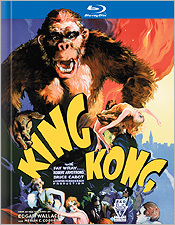 But while Kong's stop-motion animation work was certainly ground-breaking at the time, and clearly inspired whole generations of later visual effects pioneers and filmmakers, what's most amazing is just how well those effects (and the story they help to tell) hold up more than 70 years later. We've certainly seen more life-like dinosaurs on screen, thanks to the wonders of CG, and even a more realistic looking Kong. Regardless, the original King Kong remains to this day a powerful and affecting experience on screen. Presented in its original full frame aspect ratio in black & white, Warner's high-definition Blu-ray image features remarkable detail, with little dirt, dust or scratches visible. Grain is light to moderate. Younger viewers expecting crystal clarity and RED ONE detail here are being... shall we say... unrealistic, and should probably not buy this disc. The fact is that this film is nearly 80 years old, so you can't just expect perfect quality on a film like this - yes, EVEN on Blu-ray. A couple other issues of note: The production process at the time resulted in focus that was occasionally quite soft, and even when images are crisply focused in the center of the frame, there may be optical distortion around the edges of the screen. Still, contrast here is excellent, with a wide range of shadings and gradation, and the Blu-ray presentation is certainly more detailed and nuanced that today's audiences have likely ever seen with this film before - especially in the home. The film's mono audio is presented in DTS-HD lossless, in quality that's a fine match to the HD images. Music and effects are well mixed and dialogue is clear at all times. Thankfully, Warner's new Blu-ray is almost a direct port of the already excellent 2-disc DVD release from 2005, carrying over the audio commentary track with special effects masters Ray Harryhausen and Ken Ralston (which also includes occasional excerpts from archival interviews with star Fay Wray and producer/director Merian C. Cooper), the 57-minute I'm King Kong: The Exploits of Merian C. Cooper documentary, the 7-part/2-hour RKO Production 601: The Making of Kong, Eighth Wonder of the World documentary (produced with the involvement of Peter Jackson), the film's trailer, the excellent Wingnut Films/Pellerin Multimedia/Sparkhill recreation of the lost "Spider Pit" sequence and effects pioneer Willis O'Brien's abandoned Creation test footage. The only thing missing from the previous DVDs is the gallery of trailers for other Merian C. Cooper films - not a big omission. But here's what's REALLY cool about this new Blu-ray: Not only is the film now in full HD, but the "Spider Pit" recreation and the Creation test footage are as well! I can't express how cool than is, how welcome it is and how much I hope it indicates a trend that will continue in future Warner BD catalog releases. When DVD documentaries and other features were produced originally in HD, why not included them in HD on the eventual Blu-ray of the film? That's EXACTLY the kind of thing that will make the difference in a DVD collector's decision to upgrade (or not) to the Blu-ray. Thanks to those at Warner (and I suspect Wingnut and Pellerin Multimedia) who made this possible. A big Bits tip of the hat for it! And here's one other thing that's a welcome upgrade on Blu-ray: While the bonus features on the DVD had no subtitles, the documentaries on the Blu-ray DO now include subtitles - not just the two major documentaries but also the Creation piece AND the "Spider Pit" sequence! So if you're a viewer who needs the subs and you avoided the 2-disc special edition for their omission, you'll now have the opportunity to enjoy ALL the video-based extras here on Blu-ray. Again - nice touch WHV! Those of you who loved Warner's previous DVD should find this a Blu-ray well worth upgrading to. Granted, it doesn't have all the cool paper items that were included in the previous Limited Edition tin packaging (including the reproduction Chinese Theatre program and the poster art cards), but it DOES come in new book packaging featuring 32 pages-worth of gorgeous production artwork, vintage photos and liner notes by film historian Rudy Behlmer. So my approach was simply to replace the DVD Digipack with Blu-ray book in the tin. If you're interested in upgrading yourself, make sure you get a good sale price. But I think if you're a fan of Kong, the allure of finally seeing the film - and the Spider Pit reconstruction! - in full HD will prove far too attractive to pass up.